Ashley: So, Ezzie thank you so much for being here with me. Ezzie Spencer, PhD: It’s my pleasure to be here. Ashley: Could you just maybe introduce yourself to everyone really quickly and tell us a little bit about your business and your work with lunar energy? Ezzie: Of course! I am an author and a speaker and I do some consulting work as well. I basically teach others how to connect in with the moon cycle to create a better life. More specifically, to really live in the flow of life and to tap into that joy and peace and sense of purpose which so many of us are really yearning to find. It’s a personal practice that I share from my own experience and my own quest to come back to myself and to create more abundance in every single way in my own life. Disclosure: The links here are affiliate links, meaning I may earn a commission if you click through and make a purchase. Yay! Ashley: Oh thank you so much for that. I am so excited about this book! I find myself in the position of someone who really needs to read this book because like so many of us, at times I feel really disconnected from what’s happening in my body and with my emotions. We’re always looking for a way to reconnect with that part of ourselves. In your book, Lunar Abundance, this is really the main focus. It’s about this re-connection to your inner self. It’s about tuning into your own energy by using the moon as a mirror. I was wondering, could you tell us how the moon and these cycles, these ebbs and flows, really help us reconnect to that part of ourselves? – because this is a big part of what you speak about in the book. Ezzie: Yes for sure. So I really did live from the neck up in so many ways when I was younger. This is one of the reasons why I felt that there was something missing in my own life. I really felt that sense of disconnection in my life. I was working in a very different career. My job was in the field of law and there was a lot that was good about that, but I couldn’t ignore the sense of feeling divorced from who I really was. I was out of tune with the natural cycles and rhythms of my own body and natural flow of life. I also felt like I had lost that connection with the natural environment and that sense of mystery and magic which I had as a child. It started to disappear when I went down that more traditional path to get some of those external trappings of success, if you will. I wanted to come back to myself to cultivate that sense of self awareness of who I really was and why I was here on this Earth. I needed to cultivate a deeper relationship with my own feelings and emotional world, with both my inner world and my physical body as well. Eventually, I found that sense of that femininity and natural joy by working with the moon cycle. I was drawn to this very, very organically ten years ago, before it was a big thing on the internet and on social media. It was something which I started to connect with when I was writing my journal at night. I was trying to make sense of how I was feeling about my place in the world. So I started to draw little faces of the moon throughout my journal – the whole cycle, not just the full moon. I found that throughout the entire moon cycle there was this natural correlation between where the moon was in the sky and how I was feeling within myself. Those correlations would actually repeat over multiple moon cycles, so they became this pattern that would be predictable. Through this, I started to understand more about myself and the rhythms in the world. There’s a lot of theories about why the moon has the effect that it does, and one of the main theories is around gravitational pull. We know a lot about the effect that the moon has on the ocean tides. As humans, our bodies are a very high percentage of water – so why would the moon not have the same effect on us as living, breathing beings down here on Earth? That’s a causal theory as to why the moon has the effect that it does. I also work with a more correlative view revolving around the hermetic principle or correspondents, which basically guard as above so below. So what we see on the big macro level up there in the skies is the moon and all the celestial entities in the universe. We can also see like patterns down here on the micro level for us as individual beings here on Earth. There will be that replication of what’s going on in the sky is also what’s happening to us down here on Earth. In this way, we can understand the moon as a mirror. So when we look up at night and see the moon — as I always encourage people to do — they actually connect in with the beautiful natural environment. When you see the moon, use that as that invitation to come within to feel how it is that you are feeling in any given moment. Take that moment as an opportunity to stop and drop out of your to-do list in your head and your busy day and all of your obligations. Use it as a chance to really ask that question and to listen to the answer: what is your emotion at this time? Is it something that you need to go deeper into? Something that perhaps you’re suppressing that could actually provide you with interesting data? Are you feeling frustrated at this time? Are you feeling happy? What do you need to change or not change at this time in your life? You will develop greater emotional literacy by working with the moon cycle. You can feel the physical sensations in your body as well by working with the moon as a mirror. Really start to come into this deep inhabiting of yourself and that self-knowledge of self-awareness. What we will find is that as you start to tune in you can work in much more depth with the moon cycle and consciously harness that energy. However as the first step, by just tuning in and starting to pay attention, you will find that there will be enormous benefits that will flow. We don’t necessarily know exactly why the moon has the effect that it does, however what we do know and what I see in my own life and in the lives of hundreds of women that I’ve worked with around the world is that really turning into ourselves is going to have a profound effect. Working with the moon cycle will change your life in all kinds of juicy ways by allowing you to cultivate more intuition, more sense of self, more relaxation, more ease, more flow, and more sustainable success in your life. Ashley: This is so interesting. I think what you just shared about your own journey — that feeling of disconnection and finding it again through the moon energy — is such a common story. It’s such a shared story for many of us, especially as women. I mean of course men too — Just because you’re a gentleman it does not mean that you can’t connect with lunar energy. Let’s be real about that. But I think this is such a shared story, especially in this kind of modern world we live in where we are kind of all nose to the pavement just going about our day. By that I mean it’s easy to get caught up in that feeling of disconnection. I love what you said about just kind of pausing and taking that moment to realize where you are and pay attention to your surroundings. Time to really feel that connection, even in those small moments each day. I just thank you so much for sharing that. I’m also really excited about this book, not just because of the great information that you’re sharing here, but there are also some opportunities for journaling and some really beautiful inspirational images. Could you share a little bit about what prompted you to create this? I mean really, it’s like it’s this beautiful kind of creation for each person who who gets this book. What was it that made you feel called to create your book in this way? In the way you pieced together a book with information and teaching, along with creating a place for people to really make it their own through journaling exercises? Ezzie: Oh yes, well, I really wanted the Lunar Abundance book to be an embodiment of the practice, and I feel like getting out of the head, getting out of the ideas, getting out of visualizing and getting into that real, felt, embodied experience is so key. The way to be able to access that experience has to be through living it and breathing it. You have to engage with the senses, not just think about it. That intention was really clear as I was creating the Lunar Abundance book. It’s got the moon graphics and it’s got the photographs because pictures really help to tap into the natural environment. They give you an invitation to get outside and get into the bush. I’m in Australia so that’s the bush, but getting to the jungle in Bali (where I was part of the time as I was creating the book) or the ocean, or anywhere outside of the city would work. Here you can start to connect back in with your words. Even if you just find a park inside of the city if that is all that is available to you, that’s fine. As long as you’re getting your feet on the ground and starting to feel the natural wisdom of our Earth – that’s the key. I wanted the book to really tap into that, to take us out of our conscious mind and into that deep power that comes from when we are experiencing life rather than just thinking about it or analyzing it. It’s a bit of a lost art, or at least it was for me and for so many other people that I worked with. This practice is transformative, and as we do it we start to feel and connect with that deep wisdom that comes through the body. The journaling prompts are a key part of this. The book is divided into its eight main chapters because there’s eight main moon phases in the moon cycle. Each one of those eight main phases lasts for three or four days and repeats each month with each moon cycle. So there is a section within each one of those chapters for you as a reader to start to investigate yourself what’s coming up for you at that particular moon phase. What kind of action could you take in order to bring your intention into form? The first of those eight moon phases of course is around the new moon. There is a lot of information out there on how to set a new moon intention Lunar Abundance style, and then work with that intention. What is it that you want to cultivate in your life? What do you want to tap into your life at this time? Is it around bringing in more clients in your business? Around actually having a more purposeful or meaningful career? Is it about enriching your current relationship, or bringing in a soul mate? Around cultivating more of a sense of health and vitality? Is it around deepening your spiritual connection? Or is it around that sense of the spiritual qualities developing more love, compassion and joy in your life? These are all examples of intentions that you could set at the new moon and then throughout each one of those subsequent moon phases and each one of those subsequent chapters in the book. I wanted to give a practical, how to guide for people to be able to bring their ideal dream life into reality. However I didn’t want this just to be a book about a interesting ideas. I wanted this book to support people to work with the moon cycle in a very practical way so that you can see real results and real transformations in your life. By doing the work, yes, but also by allowing yourself to really rest into the Yin phases. I talk about this in a lot more detail in the book. I feel that again, this Yang hustle, doing, thinking mode is so popular, valued and in many ways rewarded in our modern western society. We have lost the art of the resting, the restoring, the listening. That comes with the Yin. Also the sense of allowing opportunities to come to you. Allowing yourself to received what the world wants to give you and allowing yourself to cultivate this innate magnetism that comes from resting into the Yin. This stems from more deeply embodying your feminine — your feminine essence. Again, that’s regardless of gender, everybody has this. I feel like working with the Yin and the Yang together in the different phases of the moon is key to so many things. Cultivating more sustainable success, cultivating the sense of magnetism and allowing the right opportunities to come to you, allowing yourself to get very clear about what type of life you want to create for yourself and then taking practical steps towards it, allowing yourself to lean back as well and receive all the goodness that wants to come into your life. So I had taught this, this is a practice I’ve been sharing now for ten years, and so I had a really good sense of the types of difficulties that people had when they were starting to work with this concept. I have a good idea of the questions that I was asked over and over again by my clients on all platforms, so I wanted to create a beautiful resource which would answer those questions and provide a guide that could sit on your bedside table as a companion. I wanted this book to really help you to connect with the moon cycle and allow you to create a better, more abundant, more joyful life – which is absolutely available to all of us. Ashley: You just touched on my very next question, which is what is it that really awaits us when we start to put this into practice? What is the transformation that’s possible and what is it that we can truly create in our lives? Is it really customizable for each person? Is it something that we choose and that we co-create and design? Or is it something even deeper than that? Is it something that the universe just has waiting for us? What is really possible when we start to put this into practice? Ezzie: I love this question and I feel like both of the things that you said are actually right, because there are these universal themes, universal drives and motivations, that we all experience as human beings. We all quest for this sense of meaning and purpose. Why is it that we’re here on this Earth at this time? What is our true professional purpose? What is this sense of being alive and being a fully actualized human being who is able to play the full range of experiences? So I can certainly speak for myself and say, if by following this practice over time, by cultivating this great sense of self-awareness for who I really am, all of the external ideas that people had put into my head about what I should be doing for my career – they all started to fall away as I started to tune into what it was that I really wanted to do. What is it that I really desired for my life? What kind of difference did I want to make in the world? What was my true purpose? Why was I born? What is my special and unique gift? This practice is helping you to come back more deeply to how it is that you feel. Come back and connect in with your own intuition, with your own body wisdom. This will help you to follow the crumbs towards finding the answers to those questions out for yourself. So that has been in a huge transformation for me and for the women who I’ve shared this practice with. I’ve seen it in people who have left jobs, which on the surface looked fantastic but actually were not even the career that they wanted to lead. They wanted to do a different job in a different area. Maybe they wanted to start their own business. Maybe they wanted to express their creativity or to start to write the book that they’d always wanted to write. To learn the instruments which they’ve always craved to learn but they’d never seen themselves as musical or artistic, or maybe they got some bad feedback when they were a kid and that has shaped and limited their world view. Expanding that sense of possibility and connecting as in more deeply without purpose is one of the key transformative elements of this practice. I also find that this helps me in living life in a way which is much more sustainable because it’s not about being ‘on’ all the time. It’s not about pushing and hustling and moving forward and always trying to make things happen. Rather it’s about allowing yourself to dance between the Yin and the Yang moves of operating. Allowing yourself to be more in the flow of life brings so much more ease and so much more grace and calm and peace into our lives. I used to be very, very stressed and anxious and perfectionist and worried about doing everything right all the time. What I’ve found is that I’m able to relax into the inevitable ebbs and flows of life now after following this practice. I can have success in external wealth, but then I can also have that more holistic well-rounded life. Most importantly, I can also experience that sense of joy and contentment and happiness in every single moment of my life. That is what is available to all of us as we start to tap more deeply into ourselves and start to find out who it is that we really are. We start to live life in a way which is really much more in flow with the natural energies and the natural orders of life. There’s also a sense of calm and ease that comes from really embodying this notion of abundance. The practice is called Lunar Abundance, because it’s not just about the lunar, feminine side of things cultivating emotional intelligence (although that’s a big part of it), it is about knowing that there is always going to be enough. You are always supported. In order to actualize your dreams, you have to have the fate and confidence to be able to set intentions and dream of the life that you really want to lead. You must allow the support of the world to show up and provide you with that abundance. So many of us, including myself, live in these places of scarcity and fear. Even though I wouldn’t have identified it, I’m putting words in the mouth of how I used to live because I didn’t know that there was any other way. What I found is that now, by tapping into the moon cycle, setting intentions to each new moon and working each moon cycle throughout each one of those eight phases of the Lunar Abundance practice, I have been able to manifest and bring into form (with the support of the universe) every single month whatever it is I am wanting to cultivate in my life. More money, more health, more vitality, specific connections, or even more intangible qualities such as that sense of ease and flow and love and laughter and joy and fun. So what I found over time is that you have so much more of a sense of personal power in your life. You have so many agencies in your life. You have that sense of being able to be a real agent of change in your own life’s narrative. You’re able to draw into your life all of the abundance that you need, and that in turn leads to this real sense of relaxation and joy. The more that you are able to experience that sense of relaxation and joy and peace and gratitude, the more good things will come to you. The moon cycle is that. For me, it really epitomizes the essence of abundance, because it never runs out. There will always be another new moon. There will always be another moon cycle. It’s this constant practice of being able to embody these ideas in your life in a way which will lead to a much better life for you and for others in your orbit. Ashley: Oh my gosh, Ezzie, I am feeling so inspired right now, so motivated. I wish that we could have you on every week because I am so charged up and excited. Thank you so much for everything that you’ve shared with us today. Ezzie: Oh, you’re so welcome. It’s been a real joy. Ashley: That was the amazing Ezzie Spencer of Lunar Abundance. Want more? 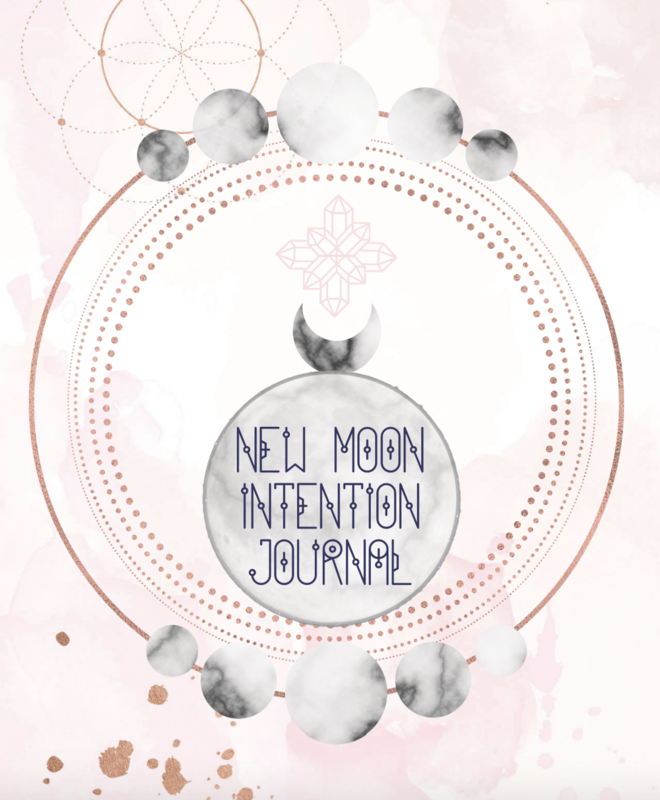 Sign up below to get a copy of our FREE New Moon Intention Journal! Recently I had the pleasure of doing an interview with Ezzie Spencer from the amazing Lunar Abundance. I've been following Ezzie for several months now and I'm always so impressed with her work, so I was so excited to sit down with her and chat about her new book. Thanks for reading, Leonie! We love moonstone too 🙂 Crystal blessings! I tried to leave a comment on the Facebook page to enter the contest but for some reason it would not post. Here is my comment: I follow a reading every new moon, given by Naisha Ahsian, for the crystals to be used in that time. Now, from March 17 until March 24, the crystals that presented are Ruby and Kyanite.